The idea of having a national declaration about Open Education in Morocco has arisen during the Morocco Open Education Day at Cadi Ayyad University on December 6-7 2016 within the frame of the OpenMed project, where a large series of projects, initiatives and thoughts in the Moroccan higher education context were presented alongside with open frameworks for technology enhanced learning and massive open online courses (MOOCs), recognition of prior learning and adoption of Open Educational Practices. During the discussion at the forum, Moroccan educators agreed that one of the biggest challenges they face is massiveness, which should not be considered as a negative issue, but classrooms may have to take sometimes hundreds of students, making teaching somehow difficult, as students may have different learning styles. Therefore, the participants agreed that the creation, use and sharing of Open Educational Resources may help paliate the current situation in which, apart from having to deal with extreme large number of students in the classroom, there is little or none recognition for distance learning. During the forum, Moroccan scholars lead the discussion towards developing a National Declaration to further support, enhance and develop Open Educational Resources, and also Open Practices in the country, following the example of Scotland and its Scottish Open Education Declaration and also, the Cape Town Open Education Declaration and the Paris OER Declaration. With such strong foundations, the scholars from Cadi Ayyad University in Marrakesh and Ibn Zohr University in Agadir leading this project, Khalid Berrada and Ahmed Almakari, started a consultation amongst Open Educators and experts from the OpenMed community and from the Scottish team led by Lorna Campbell towards drafting this declaration. While still on draft, it was further discussed and commented by some of the OpenMed members in the workshop held in UNIR in Madrid in May 2017 to ensure it was ready for publication. On July 6th 2017, once the declaration was ready, it was published in French and English as the Déclaration du Maroc sur les Ressources Educatives Libres – OER Morocco Declaration as a petition, towards requesting international endorsement from the Open Education global community before being presented to the Moroccan Educational authorities at governmental level, and other dignitaries such as rectors and deans. The declaration aims at supporting, enhancing, and developing Open Education in the country, and so far, less than a week after being launched, it has gathered over 85 signatures out of the initial 100 requested. 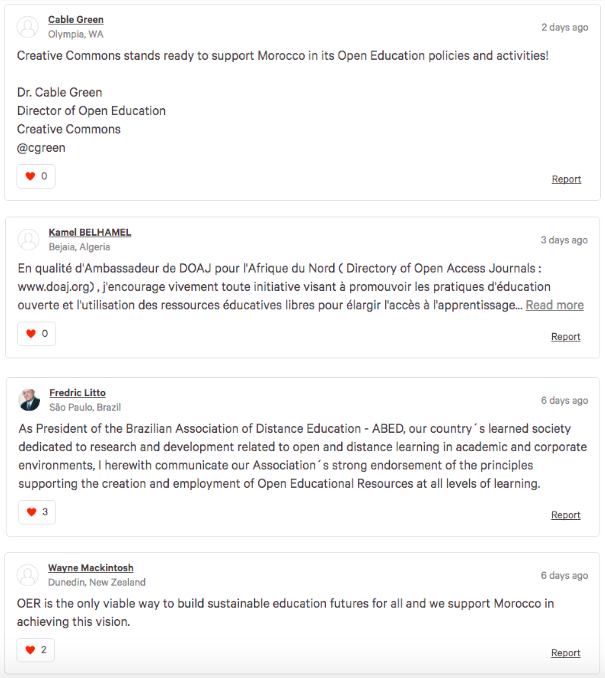 Please join us in congratulating our colleagues from OpenMed Morocco and please do sign and endorse their petition, because Open Education can change lives and improve and enhance the current educational systems.